4 pcs. customised expansion joints DN 2200 were installed in the hot blast pipeline near the blast furnace of a German steel plant. The expansion joints are designed and manufactured according to AD 2000 Merkblatt HP 0 as per the customer’s requirement. The expansion joints are tailor-made for the application, ensuring they fit perfectly in the installation and meet the operating conditions and requirements. Further, they are specially designed to absorb several types of movement simultaneously including; axial, lateral and angular movements. This design also incorporates a double bellow construction with tie rods to assist further the controlled absorption of the movements in the pipeline. The conical end at the top of the expansion joint is due to the different sizes of the connecting pipes on each side of the expansion joint. The expansion joints are refractory lined due to insulation requirements. The pipeline on the installation point of the steel plant is refractory lined in order to reduce the temperature. Without protective insulation from the high temperature medium, the pipes and installed components would have to be produced from high alloy steel – which would result in a large material cost increase. For this reason, many such pipelines are made from regular stainless steels and then refractory lined. Due to the high temperature of the medium and despite the presence of insulating materials, the inner sleeve is made from the heat resistant austenitic steel 1.4828, while the bellow material is made from 1.4571. The refractory lining was carried out by industry experts and specified by the client. Belman has vast experience with design and manufacture of expansion joints for steel plants. 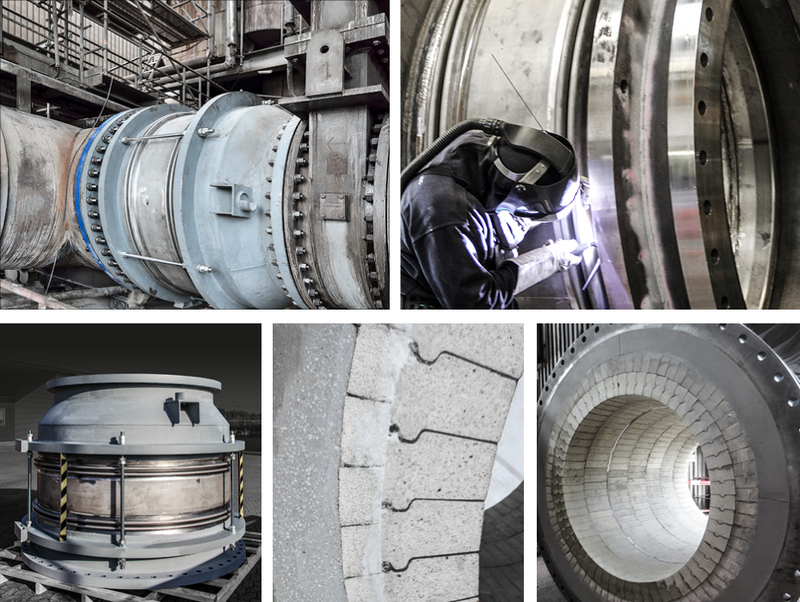 Since 1994 we have regularly supplied all kinds of customised expansion joints for steel plants all over the world. The supply of the heaviest ever made expansion joint by Belman (40 tonnes) is amongst the many successful steel plant projects undertaken.